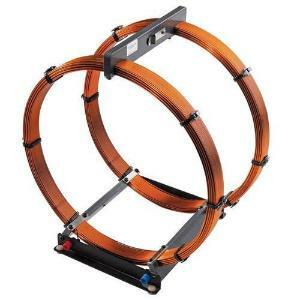 Helmholtz coils are used to produce a homogeneous magnetic field. Experiments on induction and electron deflection can be performed with the Rotary Frame with Flat Coil and the Fine Beam Tube. The coils can be used in parallel or in series and feature a spring clip on the cross bar to mount a Hall Sensor for measurements of the magnetic field. The maximum field strength generated by the coils (~ 4 mT) is approximately 750 times weaker than that produced by an MRI machine (~ 3T), which are known to be safe for use by people with medical implants such as pacemakers.